My knees bear testament to my clumsiness. They both carry faded yet visible remnants of an epic netball game played in Johannesburg in 1991. We lost. Fifty-zero. I don’t think I was the worst player on the team. Just the clumsiest. Miss Piggy is not clumsy. 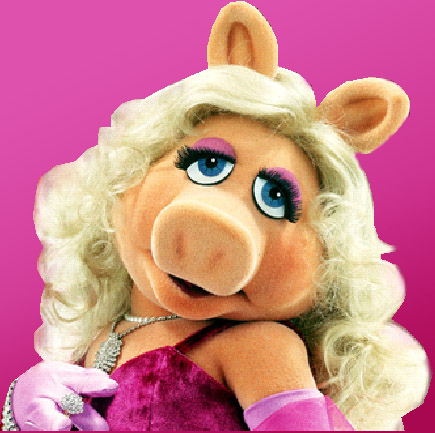 She is gorgeous and graceful in all her Miss Piggy-ness. And everything she does – from blowing Kermy a kiss to performing on stage – is a Big Number. But me… twisted ankles always. Graceless runner. Bumped elbows and bruised hips still, as I move too quickly, thoughtlessly. I went flying on that tarmac-covered netball court decades ago, bruised and scraped my knees so badly my husband will tell you it’s the first thing he noticed about me when he met me a year later. No athletic ability at all. Just clumsy. A few summers ago, my family discovered the magic of Lake Berryessa in Napa County, California. The most incredible lake I’ve ever seen. Enormous and blue with high ochre-colored banks and tall trees. Mirror-smooth water. The air is hot and dry, the water refreshingly perfect when you first dive in, just enough chill to keep you giggling and happy. We rented a speedboat, skis, and an inner tube. 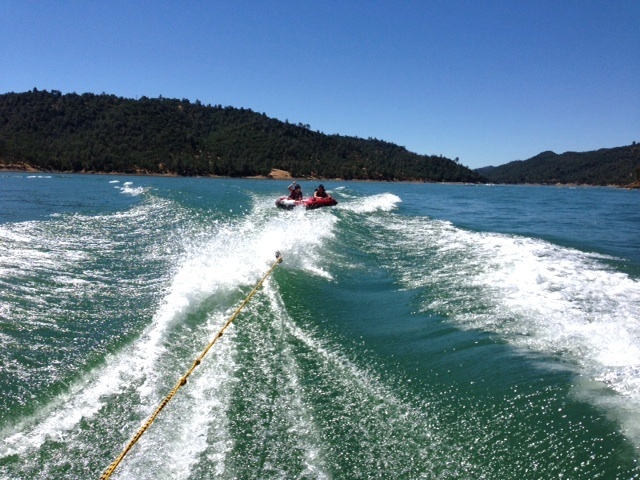 The kids tubed for hours, faster and slower, we tried to get them to fall off. The laughter bubbled out of their bodies. And then I decided it was time for my Big Number. No athletic ability. As clumsy as anything. But I can waterski. I can engage my arms, and weight my thighs, somehow balance on my wobbly angles and actually stay upright for as long as I want. I can glide over that water, cross the wake, and feel faint whispers of (dare I say it) graceful ability. My uncle taught me how to waterski. At the Vaal River in South Africa – a long, wide, gently flowing river that separates Gauteng province from the Free State. Beautiful weeping willow trees drape the riverbanks and lazy leguaans (a type of lizard) float in the water. It’s one of the most serene, tranquil places I know. And where some of my most favorite childhood memories live: swimming, barbecues, swinging from a rope off the jetty. Long lazy Sundays of laughter and togetherness. The last time I skied at the Vaal must have been around the time I scarred my knees. It was 20 years before I skied again. Before my Big Number. Shivering with anticipation and nervousness, I held the rope tight. The boat moved, I lurched and for a second I envisioned a belly-flop. But I tightened my arms, leaned back… and I was skiing! Whispers of graceful ability. I breathed in the dry California air, crossed the wake, felt the chill spray in my face, and heard my kids’ happy, whooping disbelief that their mom knows how to waterski. My childhood memories of fun and happiness, of a gentle, patient teacher with the biggest laugh in the world, propel me up and forward on that water. My Big Number. 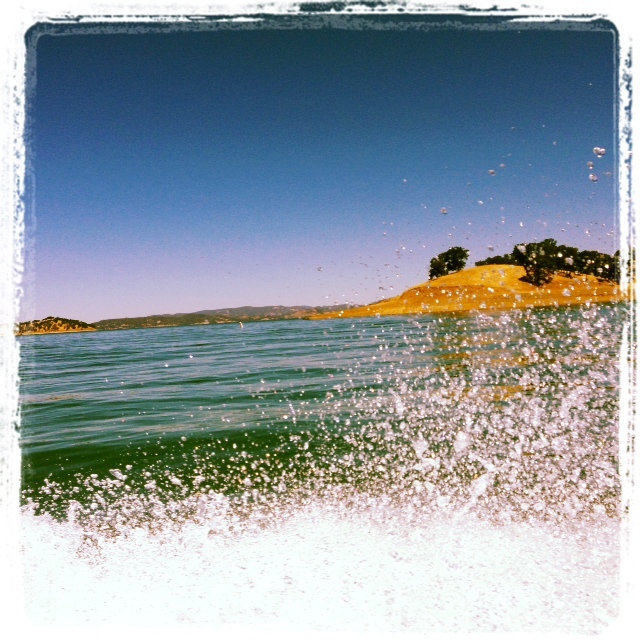 This entry was posted in A to Z Challenge, Discovering Me and tagged #atozchallenge, Big Number, clumsy, husband, kids, Lake Berryessa, Miss Piggy, mom, netball, river, South Africa, Vaal, waterski by Nicki. Bookmark the permalink. 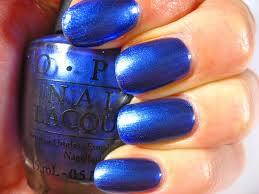 This makes me so nostalgic…the Vaal! And it’s weird, ballet’s no problem for me, but try to get me to waterski, uh uh. This all sounds so idyllic: chocolate box memories. You can imagine what kind of a ballet dancer I was :)! I am haunted by nostalgia Jenn… chocolate box memories – love that. Nicki yes – my kids remember the patient and enthusiastic teacher too. Those days certainly bring very fond memories flooding back even though I definitely beat you in the lack of athletic prowess hands DOWN – AT LEAST YOU COULD DANCE!